Risk aversion is real. The human mind is wired to prefer avoiding loss over maximizing gain. For this reason, implementing dynamic pricing may feel like gambling to some, who wonder if the rewards of revenue optimization are worth the perceived risks of customer backlash. I’ve already blogged about how dynamic pricing, implemented properly, doesn’t actually cause customer backlash. But this article isn’t about debunking myths of dynamic pricing risks. Instead, I want to examine risk associated with dynamic pricing in a different way. I’m not a gambler, myself, but earning a college degree in mathematics meant that I gained plenty of exposure to the rules of most casino games. Why? Because real-world games of chance make for convenient illustrations and exercises in the field of probability. In fact, that’s probably why I don’t gamble, because I understand the odds too well! The ultimate way to avoid risk in pricing is to take my approach to casino gambling, and decline to play the game. But if you’re offering products for sale, you’ve already taken your seat at the table. You’ve already taken a risk. What kind of gambler wouldn’t want to have as much information as possible about the game in order to maximize their chances of winning? Picking a single price at the beginning of the season and sticking with it is like deciding your betting strategy on a poker hand before any cards are dealt. Consider the popular game of Texas Hold’em Poker. In this card game, each player is dealt two cards, called “hole cards” that they keep hidden from the other players. Then, a first round of wagering occurs. After initial wagers are made, five “community” cards are dealt face-up on the table. First, three community cards are revealed, followed by another round of wagers. Next, the fourth community card is turned over, followed by more wagering; then comes the fifth community card and a final round of bets. The winner of the pot is whoever can make the highest poker hand by combining their hold cards with any of the community cards. 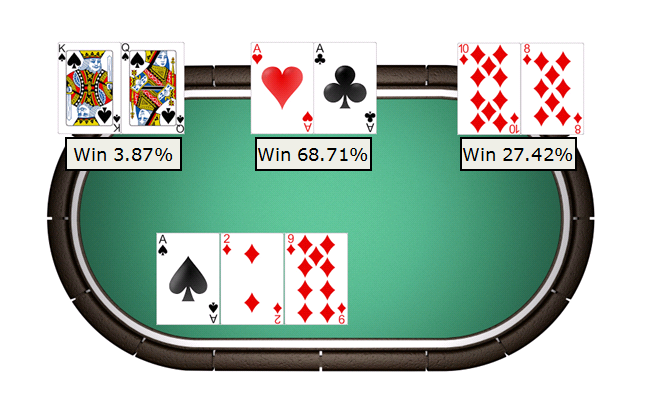 The player with 10♦8♦ now has a sizable advantage (they’ve been dealt a flush, with the possibility of a straight flush). The player with K♠Q♠ is eliminated from winning entirely, and the player with A♥A♣ can only hope that the fifth community card is another ace (to make four-of-a-kind) or a two, seven, or nine (to make a full house). You can see that, as new information is revealed, the players’ odds of winning change dramatically, and these changes would naturally inform their strategies in each round of betting. Knowledge of what cards the other players are holding. A real-time odds calculator that plays out all the possibilities every time circumstances change. The difference between you—trying to optimize pricing—and the poker player is that you have access to more information! Dynamic pricing takes into account all of your data, combines it with outside data sources, and performs complex calculations using all the available data to recommend the price that gives the best probability of success with respect to your goals as information changes. If optimizing pricing seems to you like gambling, then *not* using dynamic pricing might be the greatest risk of all. If you stick with your initial strategy no matter what, you might win the pot anyway, but you forfeit any chance to make adjustments that improve your chances of success as new information comes in. This entry was posted in Attractions, Entertainment, Retail, Sports.